This calibration Standard Operating Procedure (SOP) describes all the individual steps necessary for calibrating dissolution test apparatus type 1 (basket apparatus) and type 2 (paddle apparatus) in accordance with USP requirements and cGMP (current good manufacturing practices). 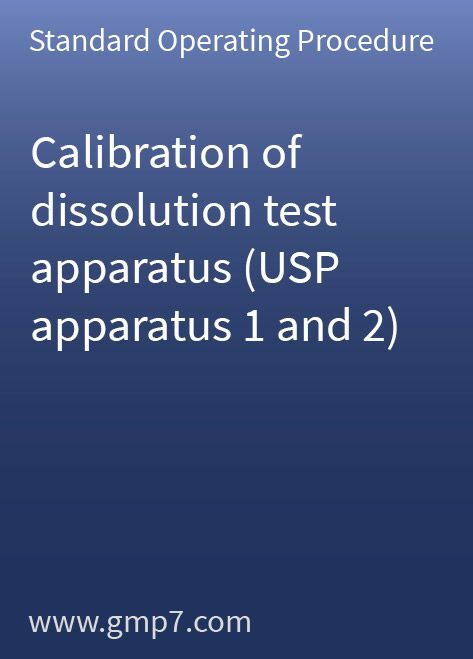 As for any calibration in the pharmaceutical environment, the calibration of dissolution test apparatus also needs to be described in a procedure and followed by the analyst in line with regulations in the US Pharmacopeia under General Chapters Dissolution. This Standard Operating Procedure (SOP) details the individual steps involved in calibration with USP disintegrating tablets (Prednisone) and non-disintegrating tablets (salicylic acid). This includes, but is not limited to, calibration of the rotation and wobble of the dissolution spindle. All necessary documentation requirements are listed in this Standard Operating Procedure (SOP) and its corresponding attachments. Both methods - Apparatus 1 (baskets) or Apparatus 2 (paddles) - and a combination of the two are described on 12 pages, including a 3-page protocol attached to the SOP. This SOP template is ready to use and needs only a small amount of site-specific modification.